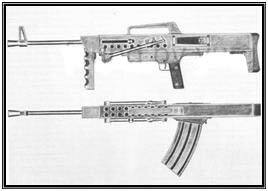 The Gordon Close-Support Weapon System (Gordon CSWS) was an exotic firearm project of Australian origin. 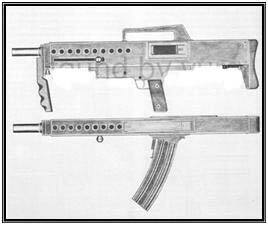 A very unusual weapon system was proposed at one time by Australian Duncan Gordon. 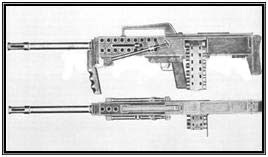 It was assumed that the basis of this family of automatic weapons constitute a belt-fed machine gun, automatic shotgun with box magazine and the double-barreled submachine gun with overhead inserted magazines (a la the Villar-Perosa SMG) is very unusual configuration. Gordon has developed its weapons, based on personal combat experience gained in Vietnam, where he served in the forces of SEATO. Design drawings and the general conception of his ideas involved in the Australian company BSP Planning and Design Pty. Ltd. in Norwood. Led the team of engineers, Peter Chant. Work began in early 1970. The system was developed by 1972, and drawings were accomplished by engineer Dale Evans. 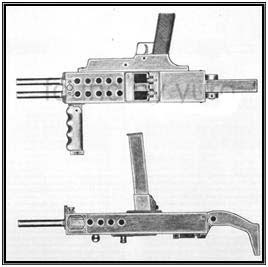 This system was a quick-barrel weapons, while the overall configuration has a mixture of ideas of the British EM-2, as well as WW2 platforms such as the German FG-42 and the US M1941 Johnson machine gun. Any type of weapon could be adapted to fire conventional rifle cartridges and 12 Gauge shotgun rounds. Automation system, applied in the arms of an identical pattern of patent 1.834.021 J. Destree, and used to solve problems by firing rifle bullets and shot with the same weapons sites.